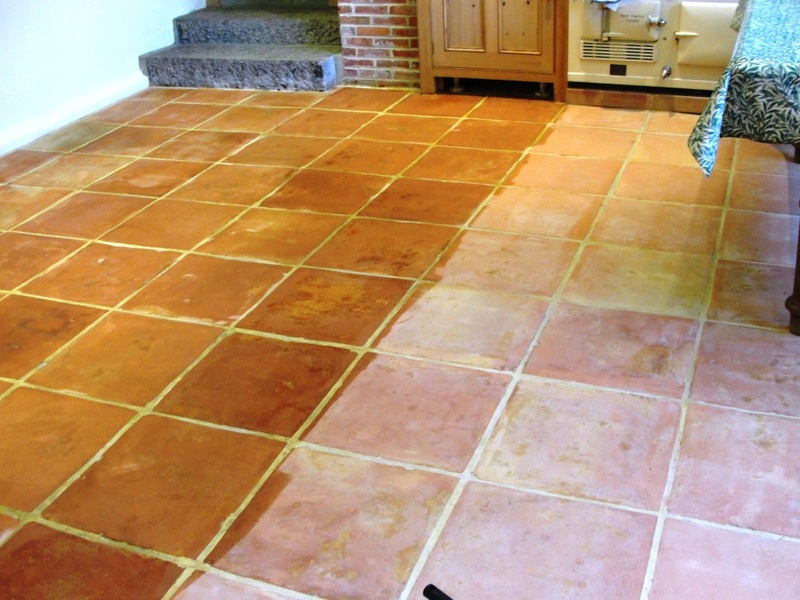 Pictures below of a job we did cleaning and re-sealing a 25m2 Saltillo Terracotta tiled floor installed in the kitchen of a house on a working farm outside Abridge, Essex. 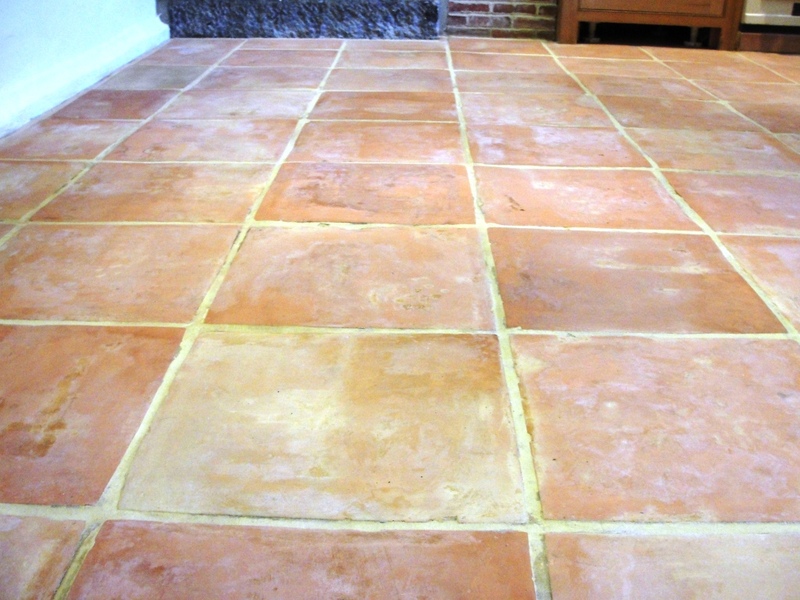 The owner had been applying coats of sealer for the last 10 years or so and over the course of time a bad build-up of layers of sealer had occurred causing and un-even and darkening effect on the tile (see picture below). Removing the old sealer to get back to the bare Terracotta surface was incredibly hard work, normally we can get most of the sealer off with a strong dilution of Tile Doctor Pro-Clean but in this case something a lot stronger was required so we applied Tile Doctor Remove and Go (which is a coatings remover designed for taking off sealers and other coatings from tile) mixed 50/50 with Nano Tech Ultra-clean which adds tiny abrasive particles to the mix. 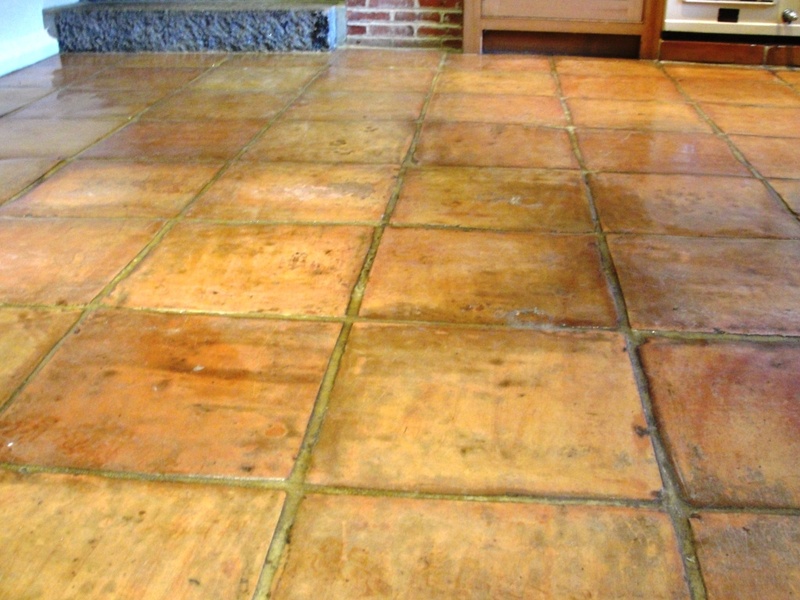 We applied the resulting solution and let it soak in for 30 minutes before tackling it with scrubbers and a steamer, gradually over the course of three days we managed to remove all of the sealer. 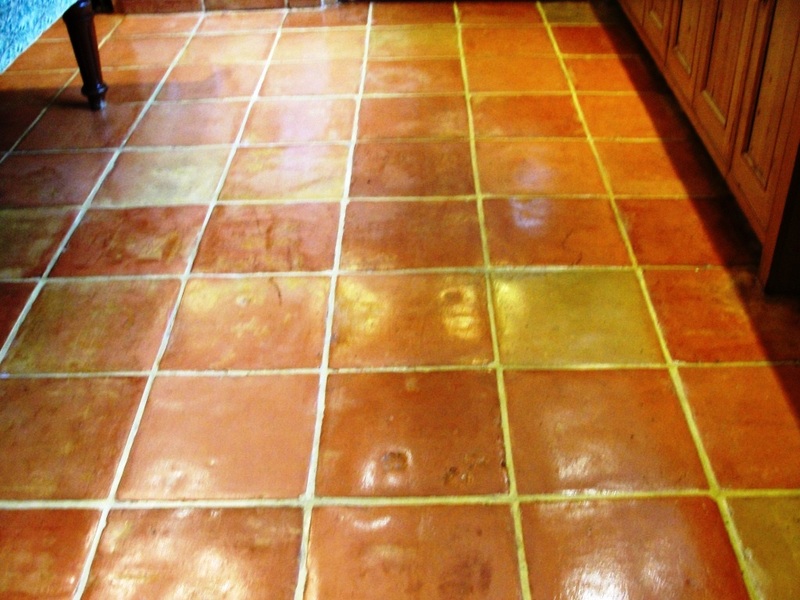 We rinsed the Terracotta down with clean water to remove any trace of chemical and neutralise the floor before sealing and then left it to dry out. We left the floor for 10 days to dry out and came back to seal it using two coats of Tile Doctor Colour Grow which is a colour enhancing sealer that protects the tile as well bringing out the natural colour in the tile. I left the floor to cure overnight, and came back the next day to finish sealing with Tile Doctor Seal and Go, Seal and Go is a water based sealer so it doesn’t give off an odour when it’s drying and also offers durable stain protection together with a low sheen finish. In the end the floor actually took seven coats of Seal and Go before it was fully sealed, this naturally took a long time to apply as you have to wait for it to dry before applying the next coat. Needless to say this was a very long job but the difference was remarkable and the owner was very happy with the result. 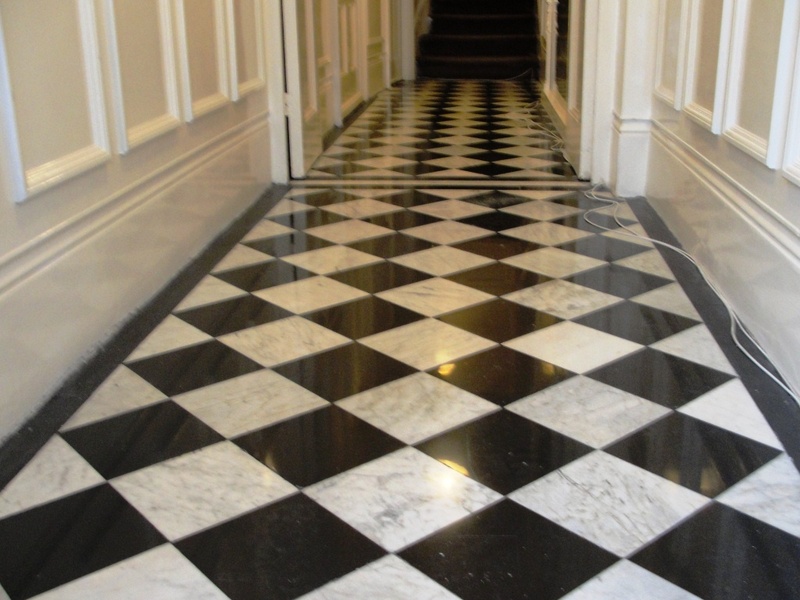 This Marble tiled floor was installed in the corridor of a very smart block of apartments in the Victoria area of Central London. 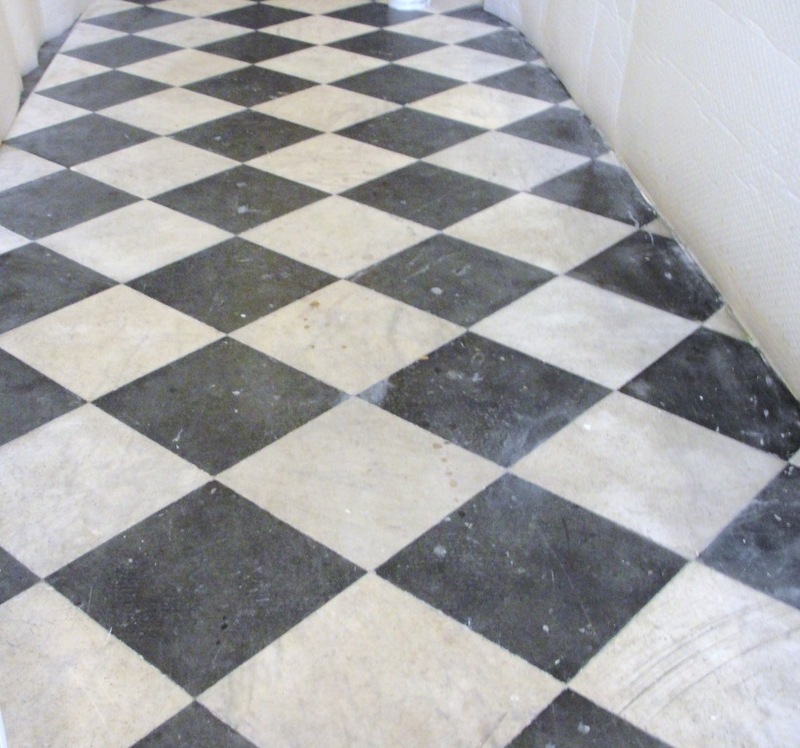 The corridor was the main access route in and out of the apartment block and was constantly being used by residents, as a result there was a lot of foot traffic and decorators had contributed to the state of the floor which was now looking worse for wear with dirt, varnish and paint spots. Having struggled to get it clean the managing agent was considering replacing the floor, that was of course until the contacted us. To remove the paint and varnish we used Tile Doctor Remove and Go which is an effective coatings remover designed for use on most types of tile and stone, we left it to soak and penetrate into the floor for 45 minutes before scrubbing it into the floor with rotary machine fitted with a black pad scrubbing pad followed by a hot water rinse to remove the cleaner. We followed this with the application of 1 to 4 dilution of Tile Doctor Pro-Clean again scrubbed in with a scrubbing pad; Pro-Clean is a Cleaner and Stripper so this step removed any remaining sealer and dirt from the Marble floor. Last step was to wash the tile down again to remove any chemical and neutralise the floor. The floor was now clean and just needed polishing to get the shine back, this we did with a set of diamond encrusted Burnishing pads which are and designed for use on Marble and Limestone. They come in different colours each one is a slightly finer grade and work to close up the pores and bring up the shine. Cleaning and polishing took up all of the day so left the day. We came back following day and sealed the floor with two coats of Tile Doctor Ultra Seal which is a premium, no-sheen, natural-look sealer that penetrates into the floor and will work to protect the floor going forward. You can see from the photographs how the combination of the burnishing pads and sealer and really made a difference in the floor. 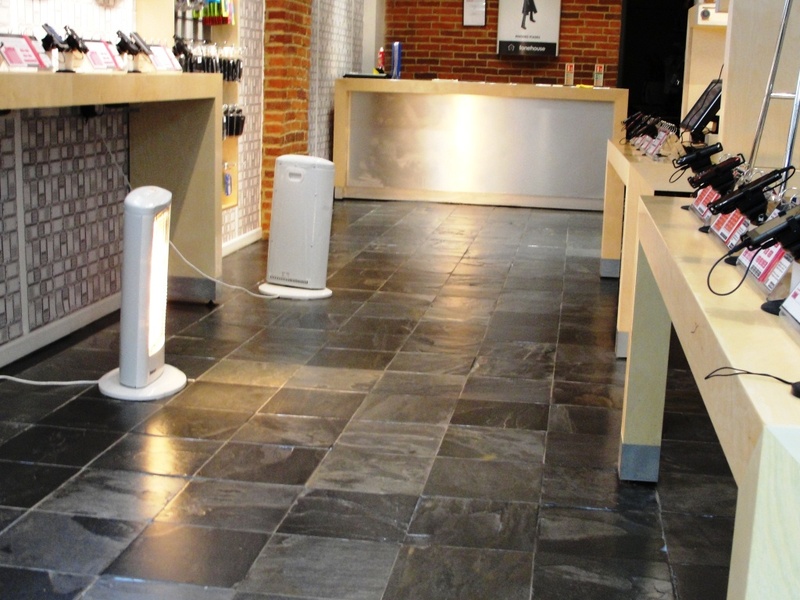 Shop floors see a lot of foot traffic and this Slate Tiled floor installed in a mobile phone retail outlet Chapel Market, Islington was certainly no different resulting in the floor becoming dull and tired over time. Were happy to cover Residential and Commercial property however in this case we had to wait until the store had closed for the evening before we could get to work. The first step was to clear the floor of any moveable displays and anything we couldn’t move was covered in a plastic sheet to protect it from splashing. We then set about cleaning the slate tiled floor by applying Tile Doctor Pro-Clean diluted one part Pro-Clean to four parts water, this was left to dwell on the floor for a short while before working it into the floor with a rotary machine fitted with a black scrubbing pad. We used a grout brush to clean out the grout lines and then removed the soiled cleaning solution with a wet vacuum to see how it looked. A quick inspection revealed more work was required, there were a few areas of ground in dirt and a stronger dilution of Pro-Clean was applied to clean these up, a number of these areas were proving stubborn so we mixed the Pro-Clean with NanoTech Ultra Clean which adds tiny abrasive particles to the cleaning agent which makes for a very effective cleaner. The wet vacuum was brought in again to remove the soiled cleaning solution and we inspected the floor again. 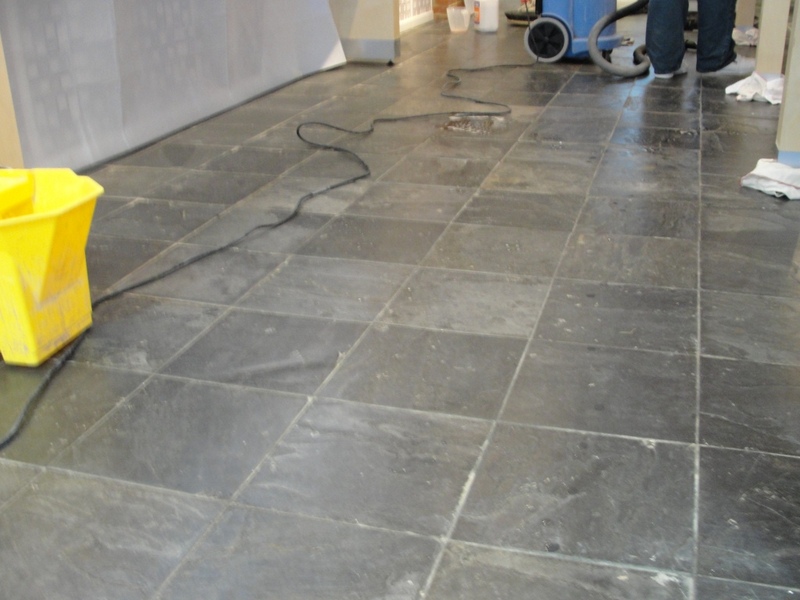 We were happy with the results so we rinsed the slate tile and grout down with clean water a number of tiles to wash away any remaining cleaning agents and neutralise the floor before sealing. A number of fan blowers were then switched on to help the floor dry and we took a break. Once the floor was dry we proceeded to seal it with Tile Doctor Seal and Go which provides good stain protection with a low sheen finish, slate is quite porous and it took five coats before it was fully sealed. We managed to complete the job in a single evening and the shop manager was very pleased with the results.